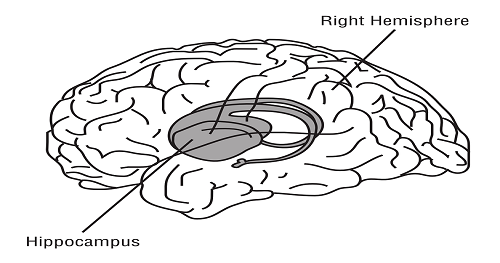 The hippocampus has a unique shape, similar to that of a horseshoe. It not only assists with the storage of long term memories, but is also responsible for the memory of the location of objects or people. We would not even be able to remember where our house is without the work of the hippocampus. Alzheimer's disease, (a disease that affects elderly people and often results in loss of memory) has been proven to have affected and damaged this area of the brain.